Be ready for any project with these rules on what should be in your tool box. Often our feelings about our tool box can be summarized with the saying, "out of sight out of mind." We simply do not think much about what is in our tool boxes until the times comes to complete a job and we can't find the right tool to get the job done. There's nothing as frustrating as beginning a job and then coming to the realization that you don't have the tools to complete the project. What should be in your toolbox? 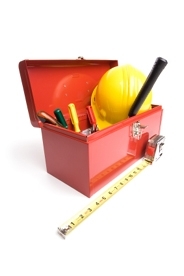 You might be surprised as to the things that are necessary to have in your toolbox. You can find just about everything you need at your local hardware store or home center. 1. Screwdrivers, both straight slot and Phillips. If you've done any home repairs at all, you're familiar with both types of screwdrivers. Straight slot drivers are the ones with flattened tips that fit into screws and bolts with a dash-shaped slot that runs along the head. Phillips drivers have four-pointed tips that fit into screws and bolts with a plus sign-shaped slot at the head. And yes, in an emergency, a butter knife has been known to substitute for a straight-slot screwdriver! 2. Hammers. There are a wide variety of hammers on the market, from small lightweight "tack" hammers to heavy framing hammers. Most have claws (straight or curved) opposite the hammer head, which are useful for pulling out nails and prying up boards. For most home repair projects, a tack hammer and a standard 16-ounce hammer would be most useful. 3. Pliers and wrenches. A standard pair of pliers and a set of adjustable crescent wrenches should be sufficient for your tool box. 4. A wide assortment of screws, bolts, and nails. Be prepared for the unexpected. You never know if you will need to hang a picture, reinforce a board, or fix a table, so just be ready. 5. Duct tape. This tape is perfect for everything from holding objects in place so you can work with accuracy to fixing that annoying table leg. 6. A can of spray-on lubricant (like WD40). Nothing is better for loosening stuck hinges, dials, and gears. WD40 is also great for taking stickers off of windows and removing crayon from your drier! Who knew that what should be in your toolbox could be so handy in other areas of your home? Undoubtedly there are other items that might be helpful for those jobs that require more specialized equipment. The tools listed above represent the bare minimum needed to tackle a wide variety of jobs that require minimal equipment and expertise. Now that you know what should be in your toolbox, learn to use those items wisely. Following these suggestions won't guarantee that an accident won't happen, but they certainly will minimize the risk. When working on anything electrical�even something as simple as replacing a light bulb�be sure that the electricity is turned off and the bulb has cooled before you begin. Explore the area around the project before you begin. Check over the work area visually and with your hands, giving objects a light touch. You will learn much and are not likely to injure yourself. Your ears and nose can also give you important information about your surroundings. Select the tools and parts you think you will need in advance. Place items in a small open carrying box secured in a convenient location. Always put tools back in the box once you've finished using to them to avoid accidents and misplaced items.